Hot on the heels of the production wrap on Jurassic World, another 2015 blockbuster has just finished principal photography as well. 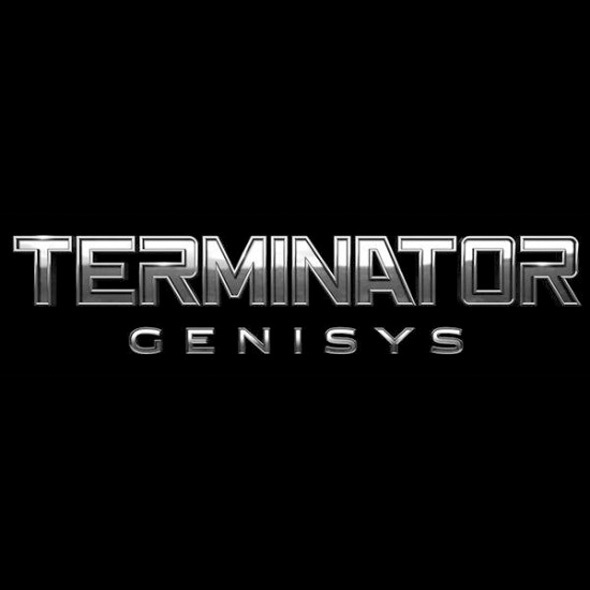 Terminator: Genisys has been revealed as the official title, a weirdly spelled version of the title we've already been using to refer to the sequel/reboot. And along with the unveiling of the official title treatment, franchise star Arnold Schwarzenegger has posted a photo from the set. No, it doesn't show the aged Terminator we've heard about in action, but it does look like the actor is wearing the iconic black leather jacket that we've all become accustomed to seeing the cyborg wear. Look! The actor posted this along with the above photo, "Hasta la vista, baby. I want to thank the cast and crew of @TerminatorGenisys for a fantastic shoot. It was challenging, it was fun, and it was rewarding. From our director to the producers, from the camera team to catering, from visual effects to hair and makeup – we couldn’t have done it without you. I can’t wait to see our finished project and I know we’ll remind the fans why they fell in love with the Terminator. On July 1, 2015, I’ll be back." Jason Clarke, Emilia Clarke, Jai Courtney and Matt Smith also star in the film directed by Alan Taylor. Stay tuned for more. Lets spell it with a "Y" it will be more edgy, aka look dumb as rocks. How do you get a job in Hollywood, pretty sure I could do a better job that a lot of the people there. It's probably the name of a system/corporation within the film. Genisys... Cyberdyne... kinda cut from the same cloth. Hrm, you could be right. I am big fan of the franchise but can someone tell Arnold he doesn't fit in the terminator universe anymore! True. No one can handle that epic quality Cameron delivers. Dare I say Michael Bay should lay hands on it. Go full tilt crazy. Many Americans can't spell genesis so don't be so surprised Aw'nold can't. I'm guessing this time around Aw'nold will appear as the aging human the T800 was modeled after. Perhaps some greedy, hotshot, bureaucrat who ran Cyberdyne for a while. This is the ONLY way I can see him being in the franchise still and would sort of connect the original film with this new one. I love the Terminator universe, so here's hoping this reboot will be an exception and will come out done right. Plus, Emilia Clarke should get her big break in the SciFi movie world. I'm pretty sure it's been said by the man himself he's an ageing T800. It was a cool B movie, really loved it as a kid, but it isn't that good a universe. Arnold keeps getting the work though so fair play to him. Genisys is the name of a new OS developed in secret by Skynet. Executive: "Wait, what if movie goers associate our film with the Hyundai Genesis? Marketing Team: "Lets spell it Genysis, with a Y" Executive: "Excellent. That sounds cool too. Am I right?" Marketing Team: "That's a yes, with a Y" (annoying laughter all around) cuz yea. Y would anyone associate hYundai with the Genesis AND the letter Y. PS: can someone photoshop "GENEYIS" on the chair for me?